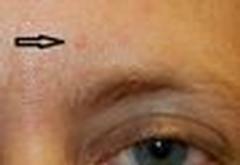 Photograph of a small, raised lesion on an individual's forehead. Trichilemmomas are benign tumors arising from the outer cells of the hair follicle. They are commonly found on the head and face, as shown.